The sculptures that you have seen have all started from a clay foundation applied to a frame created specifically for the subject. However, before any modeling can begin exhaustive research is conducted to gather as much information as possible related to the subject. From artwork to historical accounts, these are used to ensure an accurate, representation of the subject. With this information in hand, the forming of the clay into a piece of historical art can begin. After many months, the clay sculpture is complete. 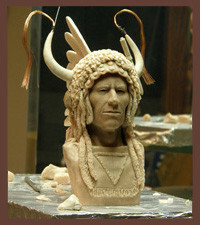 This sculpture is then brought to Kalispell Art Casting located in Kalispell, Montana. In order to make multiple editions of Michael's bronzes the foundry applies an ancient method called the Lost Wax Method to create multiple castings. This is an ancient Greek casting method dating back approximately 3000 years. After the original clay sculpture is removed, the rubber and Mother Mold are reassembled to create a mold to pour in a wax foundation. Wax is heated to about 275°F and poured into the mold until the inside has an even coat. This is followed by cooler wax until the proper thickness is achieved. When the wax has solidified it is given to a foundary artist who inspects the wax mold to ensure all the details from the original clay sculpture are preserved. If some of the detail during this process has been lost, the foundry artist carefully adds the missing details back into the wax mold. This wax mold goes through several steps to create a ceramic shell which encloses the wax sculpture. The ceramic shell is exposed to an immediate 1800°F which causes the wax to melt immediately. What is left is the ceramic shell with the negative impressions left from the wax sculpture. 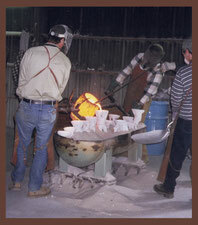 Bronze ingot (90% Copper, 10% Tin) is poured into this ceramic shell and left to cool for four hours. The ceramic shell is removed and the bronze is sand blasted. 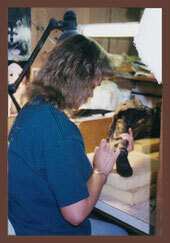 The bronze is carefully inspected to ensure that the bronze sculpture is identical to the artist orginal. The patina (or color) is achieved by heating the bronze to approximately 350°F and then applying different chemical and/or acid formulas to the hot bronze. The bronze is then mounted on a wooden or stone base and finally shipped back to the artist. What makes Michael's bronzes unique is that when the bronze arrives at the Westergard-Ragucci Studio, Michael personally inspects and applies his own special finishing techniques to each one, further enhancing the sculpture and adding to the historical nature of the subject. With the purchase of a bronze you can be assured of an entirely unique, original, and handcrafted piece of art.